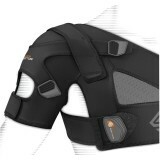 Will - So Cal decent "I love this shoulder brace, it works well for my injury. Just have to adjust it every time I use it to get the best fit. And its held up pretty well these past few months." Kramer Shock Doctor 842 Shoulder Strap Support "The directions of the shoulder straps are not properly angled for maintaining the proper relationship between the Glenoid and Humeral head which make up the shoulder joint stabilized by the rotator cuff. I have had to improvise with additional straps placed in more effective positions. It's still less than optimal to properly position the shoulder joint/rotator cuff complex. If the user has a partially dislocated shoulder or stretched/sprained rotator cuff, the strapping does not optimally pull the humeral head up and into the shoulder 'socket.' That is, the strap configuration does not properly maintain or optimize the relationship between the 'socket' and the Humeral head. The designers of this have not properly analyzed the vectors! They should verify their design with a trained physical therapist, an Orthopedist. and a Physical Medicine physician. For now before a redesign, additional long straps should be included with the product with recommendations for placement by including pictures with anatomical references. Overall, I think your design is headed in the right direction, and I am personally looking forward to version 2.0, so don't be discouraged. Rather be inspired. Good Luck Carl L Kramer MD kramer.carl@rcn.com"